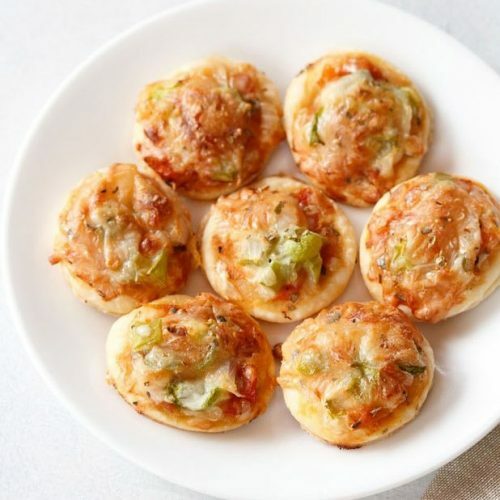 pizza puff - easy method of preparing bite sized puffs made with pizza toppings. before you begin, making the pizza puffs, preheat your oven to 250 degrees celsius/480 degrees fahrenheit for at least 15 minutes. if you used the puff pastry recipe, which i have posted on blog, then slice the puff pastry in three equal parts. take just one part and wrap the remaining two parts in a foil or cling film and refrigerate or freeze. if using store brought puff pastry dough, then follow the instructions on the pack. sprinkle some flour on the dough and begin to roll. roll evenly to get a ¼ to ½ inch thick base. using a cookie cutter or a lid from a bottle, cut rounds in the rolled puff pasty dough. remove the dough from the edges. roll them and then use it for making another batch of pizza puffs. gently remove and place each round in a baking tray. spread pizza sauce on the rounds. you can either use store brought or homemade pizza sauce. i have used homemade pizza sauce. even tomato sauce or tomato passata can be used or you can use your favorite sauce. top the roundels with some chopped onions and chopped capsicum (green bell pepper). you can also add chopped olives, steamed corn, sauteed mushrooms or any other veggie. now sprinkle some grated processed cheese or pizza cheese. also sprinkle some dried oregano. you can add a mix of dried herbs too. keep the tray in the oven. bake at 250 degrees celsius/480 degrees fahrenheit for 20 to 25 minutes till the cheese on top has got golden and the puff pastry rounds have also got golden and crisp. do check the base and it should be golden. let them cool for a few minutes. if not serving immediately, then place them on a wired rack. serve pizza puff hot or warm or at room temperature. your choice of veggies or herbs can be added.